Samsung CMS Report gives managers complete visibility of call traffic and call costs for single or multiple sites, with the ability to charge costs to different individuals, departments or clients. 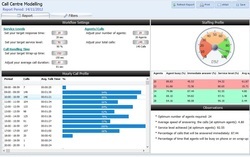 Primary call statistics can be displayed on a wallboard or PC monitor. Samsung CMS Record, a plug-in module for Call Reporting and Contact Center, provides a complete management and call recording solution. You can use it to store, find, playback, archive and email encrypted recordings. Monitor call quality and staff performance to improve company standards and customer care. Resolve “who said what” disputes by confirming details from a call such as quantities/specifications of an order, protecting both your business and your staff from disputes. Samsung CMS Contact offers Contact Center Reporting. This module delivers detailed performance reports for the contact center and individual teams. It also provides real-time statistics on key performance indicators that can be shown on a desktop PC or large screen display. Business analytics enhances call reporting by adding missed call analysis, staff modeling tools and high-level business reporting. CTI for supervisors to control and view agent's status. Brings call center and handset functions to the agent’s desktop to view agent’s call history, call previews and performance statistics. Call handlers will spend more time talking and less time dialing with the Samsung Contact Centre Progressive and Predictive Dialers.